[box type=”note” size=”large” border=”full”]The Creative Block Club is currently CLOSED to new members. Announcing the launch of a brand new subscription box service for creative thinkers! Traditionally, experiencing a Creative Block has never been fun. It’s a situation where your flow of innovative thoughts has slowed to a trickle or been clogged-up completely. It feels like you’re trying to pedal a bike up the side of a mountain and the peak is nowhere in sight. You know logically that if you can reach the crest, it’s all downhill from there — but emotionally it’s tough to keep. pushing. those. pedals. Blocks aren’t supposed to be something you stumble over, they are supposed to be something you play with! 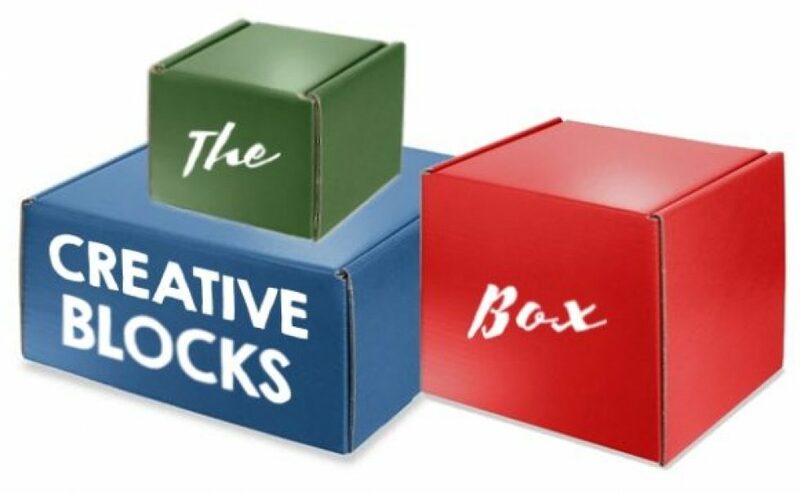 Your annual membership in The Creative Blocks Club means you’ll receive quarterly conveyances of colorful cardboard boxes containing carefully curated collections of creative catalysts confirmed in their capabilities to increase your creative capacity. Some of the items being considered for inclusion in the Creative Blocks Box! 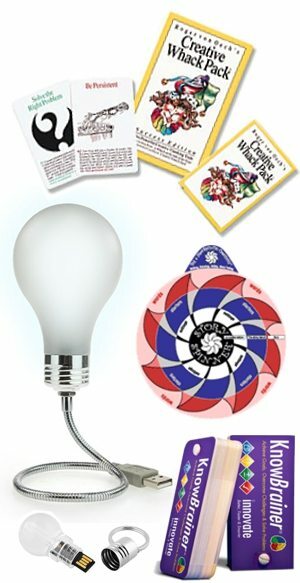 The cool products (we call them Creative Catalysts) selected for inclusion in the box will vary with that quarter’s theme and assignments, but will include such things as books, music, movies, games, office supplies, art prints, apparel, food, drink, mugs, card decks, desktop toys, puzzles, journals, notebooks, gizmos, gadgets, and thing-a-ma-jigs. The creative lessons and advice alone (along with the fun products!) are worth joining the club — but the value of the ideas those items can help you generate is incalculable. Your membership also includes access to a private members-only Facebook Group where you can share your personal creative challenges and bounce around ideas with other Creative Box buddies. This community page is also where you will be able to access bonus downloads and redemption codes of digital products and apps that are not conducive to traditional shipping methods. And of course, Don The Idea Guy will present as your host to add extra brainpower and content when needed, as well as broadcast live video updates and walk-throughs of the quarterly box content and creative quests. The regular price for membership when this club opens to the public will be at least $400.00 per year ($100 per box) plus shipping and handling. …and even more stuff as it becomes available! You have received a private invitation to join the BETA launch of The Creative Blocks Box Club because you’re a friend and follower of Don The Idea Guy. We’re asking a small group of friends to sign-up and experience the program in order to test and research what works and what needs to be improved before opening membership up to the general public. As a charter member, we’ll be asking for your feedback and opinions via occasional polls and surveys on what you think about the club. We want to know if you’re enjoying the course content, which creative catalyst is your favorite, and is this service something you would renew, recommend to friends, or give as a gift to family members and business associates. Because we value your insights (and know we’re asking you to take a little extra time to share them with us) we wanted to show our appreciation by offering you a one-year exclusive membership at a deeply discounted price. 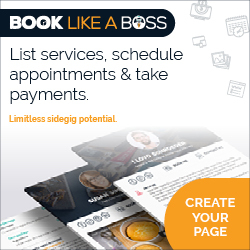 Only $200 for one-year Charter Membership in The Creative Blocks Club! 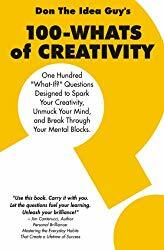 That’s just $50 per box delivered to your address via USPS each quarter; filled with lessons, ideas, challenges, and tools designed to help you crush your mental blocks and increase your level of innovative thinking. This initial opportunity for Charter Membership will be limited to just 50 people and only available for a limited time. This membership will not auto-renew and this price may never be offered available again. Assuming the club continues beyond its initial BETA year, you will be invited to sign-up for a new subscription at the best price available at that time. Important: Due to the logistics involved in getting an accurate count in order to purchase and secure the items that will be included in boxes, cover costs for printing fixed quantities of course materials, and order sufficient packing materials and supplies — your investment as a charter member is non-cancellable, non-returnable, and non-refundable. If you really do just simply hate the program for some reason, we will allow you to convert it into a “gift membership” and change the address to which we’re shipping (as long as it is within the continental United States.) Alternatively, if we have anyone who asked to be added to a Wait List, we’ll give them the opportunity to “buy out” the remainder of your membership and issue you a refund for the number of unshipped boxes. Enrollment will end once the 50-member Charter Subscriptions have been claimed. These 50 memberships are available on a first-paid/first-subscribed basis. If you have any other questions about the club, its policies, pricing, etc., please send an email to: questions@creativeblocksclub.com. © 2017 by Don The Idea Guy and The Idea Department. All rights reserved.